White rings caused by heat and water are amongst the most common, yet most difficult to repair touch-ups on finished furniture. Until now (or we wouldn’t have brought it up in the first place!). 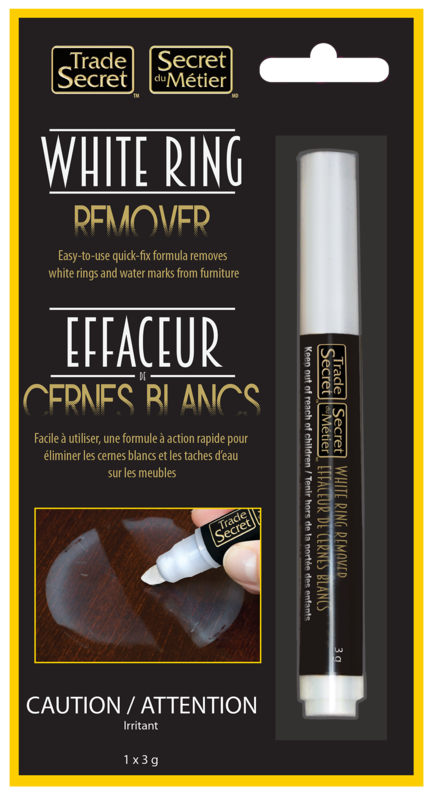 The Trade Secret™ White Ring Remover Marker will remove most white rings and water marks from finished wood surfaces. They disappear without stripping, refinishing or harming the finish. 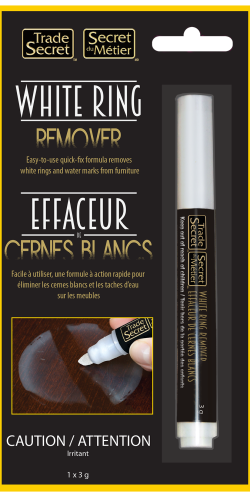 It can be used on varnishes, lacquers, French finishes and harder contemporary finishes. After testing in an inconspicuous area, simply apply liberally to the affected area, allow to dry for 1-2 hours and buff with a clean cloth. Reapply if necessary. Presto! That ugly eyesore that’s been the source of embarrassment is gone leaving behind the original untarnished beauty of your furniture.